Fr. Jeremy King, OSB, Choirmaster of Saint Meinrad Archabbey, has been invited by Classic Choir Tours to help lead a pilgrimage to scenic Austria and Switzerland from April 9-18, 2008. These two Alpine nations along with Germany have had a great influence on the Church in the United States since the roots of many American Benedictine monastic communities of men and women can be traced to this part of Europe. Benedictine liturgical music on both sides of the Atlantic continues to be based on the treasury of Gregorian Chant and today that treasure has been adapted to fit modern languages for use in many religious communities and parishes. 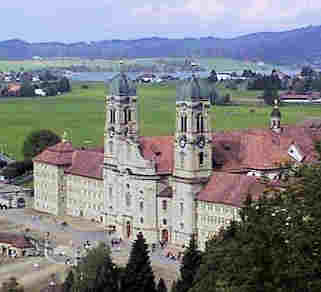 On this tour from Vienna, through Salzburg and to Saint Meinrad’s Mother Abbey, Maria Einsiedeln, there will be opportunities to join monks from famous abbeys as they sing the Liturgy of the Hours and celebrate Mass. This pilgrimage can be a great time for renewal and learning. We will learn some easy Latin and English chants for our own celebrations in each place. There will be NO AUDITIONS!! Just come and sing and listen as well as take in the awesome sites of the mountains and places we will visit. Detailed information about each day can be found by clicking on the link to that day. confirmations from many organizations in Europe. Because of changes in local European schedules we may need to alter specified events or venues to better fit the overall plan.